Many of us probably take a hot shower for granted, but the team at Lava Mae understands its restorative power. While a shower gets us clean, it also provides the time and space for a little mental health break. And for those living without a home it can restore a sense of dignity. 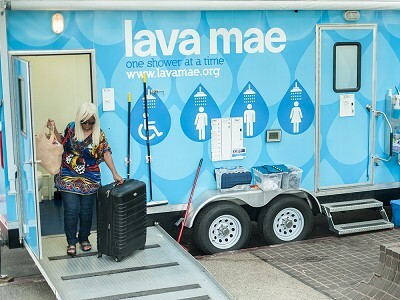 Lava Mae brings critical hygiene services to the streets of California by transforming public transportation buses and trailers into mobile shower and toilet facilities. They call their care-based approach "Radical Hospitality". The group’s goal is to help those experiencing homelessness feel a sense of hope and walk down the street with their heads held a little higher. 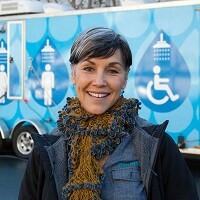 Founded in 2013 by Doniece Sandoval, the organization has served thousands of guests and has expanded beyond San Francisco to the greater Bay Area and Los Angeles. Their Pop-Up Care Villages expand access to essential health and hygiene supplies while Lava Mae’s open-source platform helps people and organizations replicate these much-needed services in their own communities. 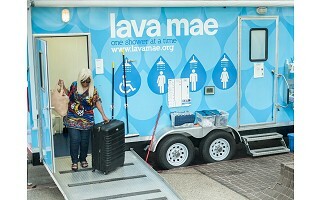 Lava Mae brings critical hygiene services to the streets of California by transforming public transportation buses and trailers into mobile shower and toilet facilities. They call their care-based approach "Radical Hospitality". The group’s goal is to help those experiencing homelessness feel a sense of hope and walk down the street with their heads held a little higher.